This classic sci-fi movie set the bar for many that followed. I first presented this post in 2015. This should be an easy one for you. What sci-fi show am I thinking about? It involves a starship traveling the galaxy on a deep-space exploratory mission. The captain is usually found in the company of his first officer and the ship’s doctor. Its plot is as much a morality play as it is a space adventure. Easy, huh? That has to be Star Trek, right? Wrong-o! 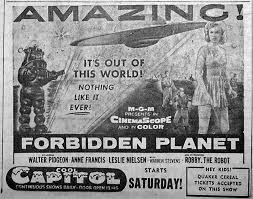 In 1956, years before the initial voyage of the starship Enterprise, the much-honored movie Forbidden Planet broke all sorts of new ground. It is considered the first science-fiction film to depict humans exploring the galaxy in a starship of its own creation. Its setting was another world far from Earth, not your standard “invasion” story. The film’s unique soundtrack was entirely electronic music. In a nutshell, Forbidden Planet set the precedent for decades of sci-fi shows and movies to follow, including Star Trek. But as a kid back then, I didn’t know all of that stuff. I just knew that Forbidden Planet was one of my favorite movies, for lots of reasons. With that hokey tagline—and a spoiler alert firmly in place—the story opens in the 23rd century aboard the starship C-57D (a flying saucer) on its way to the distant planet, Altair IV. Seems that, two decades earlier, a scientific expedition sent to this world aboard the starship Bellerophon fell off the radar. The orders for Captain J.J. Adams (Leslie Nielsen—“Don’t call me Shirley!”) and his crew are to find out what happened to these people. Starship C57-D makes ready to land on Altair IV. 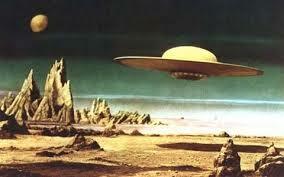 Nearing the planet, the ship is contacted by Dr. Edward Morbius (Walter Pidgeon), a scientist from the Bellerophon. He insists everything is fine and tells Adams to turn back. No way, says Adams; they’re going to land. If they do, Morbius tells them, he can’t guarantee their safety. What’s that about? No “beam me down” here…the ship lands and is met by a robot named Robby, who takes Adams, Lt. Farman (Jack Kelly), and Doc Ostrow (Warren Stevens) to Morbius’s compound. Morbius tells them that the rest of the Bellerophon expedition, with the exception of his wife and daughter, were destroyed by some unknown planetary force, something that he cannot—or will not—explain. His wife later died, leaving only him and his daughter, Alta (Anne Francis, a prime reason why this film was one of my favorites). This force has not returned—but, he says, you never know. Adams (Leslie Neilsen) and Alta (Anne Francis) fall for each other in a hurry. When some equipment aboard the starship is sabotaged by an invisible intruder, Adams and Ostrow return the next day to confront Morbius. The scientist shows them the wonders of the Krell, an advanced race that died out 2,000 centuries earlier. A Krell “educator” enabled him to double his IQ with a brain boost—though it nearly killed him—and he’s been studying these beings ever since. That was how he could build Robby, among other things. Morbius then takes Adams and Ostrow on a tour of a vast underground power complex, still operational and driven by the equivalent of over 9,000 thermonuclear reactors, the Krell’s Great Machine. Adams insists that all of this knowledge should be put under Earth supervision, but Morbius, acting godlike in his kingdom, says that humankind is not ready for this. At the same time, Morbius has fallen asleep in the Krell lab. When he hears his daughter screaming, he awakens. As his head snaps up, the creature at the ship disappears. Alta tells him that she had a nightmare in which a monster was attacking and killing the starship’s crew, specifically Adams, with whom she’s fallen in love. Adams and Ostrow decide that one of them should take the Krell brain boost in order to understand what is going on. While Adams confronts Morbius, Ostrow sneaks off to the Krell lab. Robby carries him in a few minutes later, near death. Ostrow explains that the Great Machine enabled the Krell to create anything they wanted and project it to anywhere on the planet. But they overlooked one thing: “Monsters from the id,” Ostrow gasps before he dies. While Morbius, the genius, doesn’t get it, Adams does. After his brain boost, Morbius was able to summon the mindless primitive from his subconscious—his id—to stop his Bellerophon peers from leaving Altair IV. This, Adams says, is precisely what happened to the Krell when the monsters from their ids destroyed the entire race in a single night of madness. Morbius is into serious denial here, but when Alta declares her love for Adams and her desire to accompany him back to Earth, the monster is again unleashed. Morbius orders Robby to destroy it, but the robot, programmed against causing any harm, short circuits. 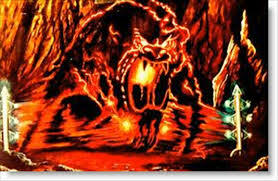 The monster pursues them through the complex, melting supposedly indestructible Krell metal to get at them. Morbius continues to deny what Adams is telling him, until they reach the last room, and the monster starts melting the door. To save his daughter, Morbius finally confronts the beast, and it fades away. Morbius instructs Adams to set a self-destruct device that will annihilate the planet in twenty-four hours, and he then dies. 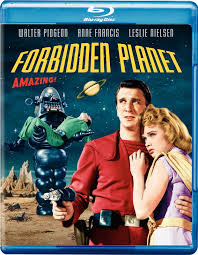 In 2013, Forbidden Planet was entered in the National Film Registry of the Library of Congress as being deemed “culturally, historically, or aesthetically significant.” Check it out; it looks awesome in Blu-Ray, with none of the cheesy effects that marked many “B” movies of the 1950s.